This is tutorial about how to crochet apple cozy. 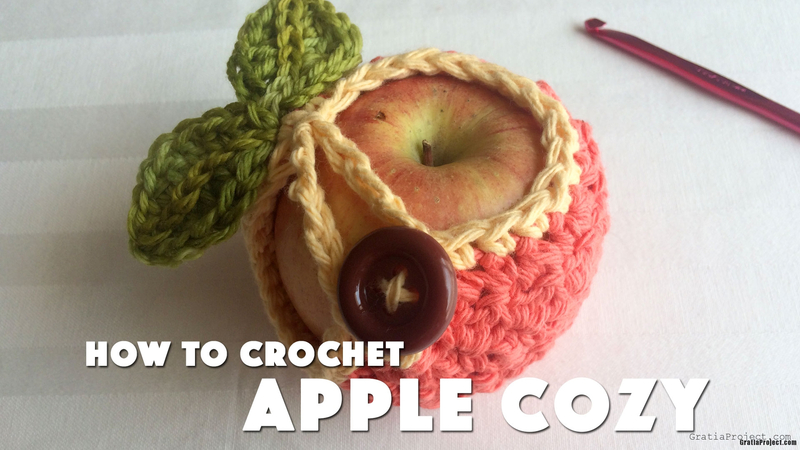 Learn how to crochet apple cozy. It’s a great unique gift for your loved one. In this tutorial, I used Lily Sugar n Cream (worsted weight, 100% cotton), and US I9/5.5 mm (Susan Bates Aluminum Crochet Hook). sc2tog: single crochet 2 stitches together. Finished size is for apple with diameter 9 1/4 inches. Round 12: Ch 1. Turn. (Sc, sc2tog) repeat until last 2 sts. Sc2tog for last 2 sts. Join with invisible seam stitch. Using contrasting color, sc in each stitch. Join with sl st to the first sc. Continue ch 14. Cut the yarn. Use tapestry needle to sew the tail. Start from 2nd loop from hook. Sl st, sc, hdc, dc, dc, hdc, sc. Ch 1. Go to the other side. Sc, hdc, dc, dc, hdc, sc. Join with sl st.
Sl st across center of the leaf. Without cutting the yarn, continue making the second leaf. Sew leaves and button onto using tapestry needle.